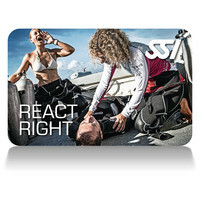 React Right is SSI’s emergency training program, consisting of the following basic components: Primary Assessment, First Aid & CPR Skills, Primary Stabilisation Techniques, and includes two optional components: Oxygen Administration in Diving Emergencies and Automated External Defibrillation Basics. During the course you will gain the skills and knowledge required to provide an advanced first aid response, including management of the incident, casualties, by-standers and other first aiders, until the arrival of medical or other assistance. We also offer VET Nationally Accredited First Aid Training for individuals, groups and businesses. Businesses or staff members who are required to provide an emergency first aid response in a workplace. You must be physically capable of performing at least 2 minutes of uninterrupted single rescuer cardiopulmonary resuscitation (CPR) (5 cycles of both compressions and ventilations) on an adult resuscitation manikin placed on the floor and on an infant resuscitation manikin placed on a firm surface. You will need a USI (Unique Student Identifier) number. If you do not have this you can register for one here – www.usi.gov.au. There is online training that must be completed in advance of the course. Click here to register for your online training. The online training component takes approx. 3 – 5 hours. After you have completed your online training and exam, you will attend a half-day or evening session at Pro Dive Magnetic Island to complete the practical exercises. Students will be assessed through the demonstration of practical skills, participation in role plays, scenarios, analysis of case studies and a written quiz. Students who successfully complete this training will be awarded the SSI React Right certification. A statement of attainment HLTAID003 Provide First Aid and/or HLTAID001 Provide Cardiopulmonary Resuscitation certification for relevant candidates. It is recommended the First Aid unit be renewed every 3 years in line with industry standards, with the CPR component being updated every 12 months.